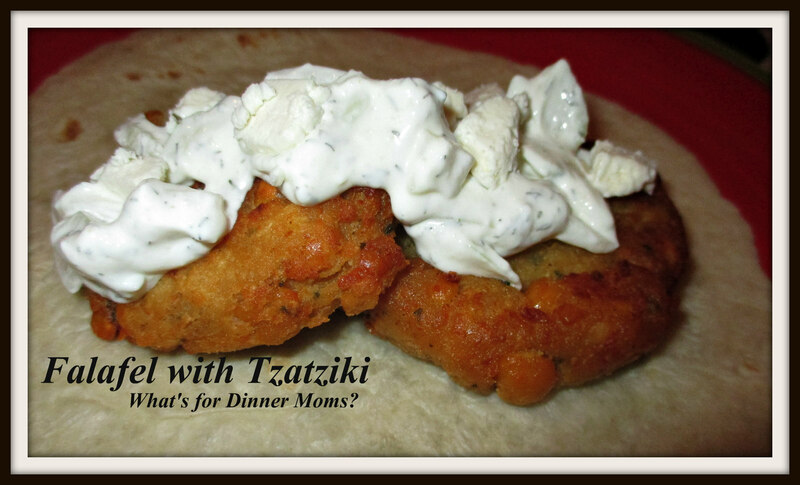 Falafel with Tzatziki – What's for Dinner Moms? My family LOVES garlic. We go through at least 1 jar of minced garlic and 1 jar of powdered garlic a month. Italian food, Greek food and Chinese food are always at the top of our go to list for menu items. I was searching through Pinterest to find something to make with the large cans of chickpeas I bought. There was a good sale and since we are cutting back on the amount of meat we were eating I bought several 30 oz. cans of chickpeas. Falafel was the easy choice. Long ago in another lifetime I live in the Catskill Mountains and little Falafel places would open up every summer. I have a love/hate relationship with falafel. Sometimes the texture is too dry and crumbly. I like my falafel with tons of flavor and a bit of a creamy texture in the center. This recipe was a hit! Everyone like the falafel and wish I had made more for the next day. I loved that it was simple to make, my son made the “dough” and the patties with my oversight. A simple fry and these were ready to eat! Make the chickpea mixture in the morning with the tzatziki, they are always better after they sit and the flavors meld together, and you will have dinner ready in 15 minutes! For my mostly gluten-free son we substituted gluten-free flour for the all-purpose flour. If you are using a one-to-one substitute the amounts should be the same but if they seem to mushy add a bit more flour to make the patties. I served this with a substantial spinach salad for dinner. I realized that I never wrote down a recipe for Tzatziki sauce because it is one of those things I made by taste. I put the ingredients in a bowl and stir. Taste and add more garlic, dill and salt until it tastes good to me. We like ours with lots of garlic. You may wish to start with less garlic and build up as you taste it. Stir and refrigerate for at least 30 minutes to allow flavors to blend together. In a food processor, or with a fork, mash the chickpeas, minced garlic, powdered garlic, cumin, parsley and lemon juice together. Make it into a paste. Some larger chunks of chickpeas are okay but you want to have mostly paste. Stir in flour to paste mixture. Form the mixture into 8-10 patties of equal size. Heat oil over medium-high heat. Slowly lower patties into the oil cooking 2-4 minutes per side, until golden brown. Flip and cook other side. Remove patties from oil to paper towel covered plate to absorb any extra grease. Serve warm on a tortilla, if desired, with Tzatziki sauce. I could eat this right now! Looks delicious! Thank you! One of our favorites. I LOVE falafel! Thanks for sharing such an easy recipe. I can’t wait to make this! This falafel has a real garlic taste with just a bit of a sneaky flavor from the cumin. The chick peas add more of a texture than a flavor. So the garlic in the patties and garlic and dill tzatziki are the main flavors you taste.